Matter Manipulator is the first tool players obtain. It's obtained in the intro mission after the Grand Protector is pulled into the ground by a tentacle. It can be upgraded as the game progresses, and it remains the primary mining tool throughout the game. The default hotkey to switch to and from the Matter Manipulator mining mode is 'R'. Additional functions can be unlocked as the game progresses including Wire Mode and Paint Mode. At first, the Matter Manipulator's mining function deals 1.2 block damage 4 times per second to blocks in a 2x2 square. Upgrades to the Power Generator improve block damage by 1.2 per upgrade, and upgrades to the Matter Proc Unit increase the dimensions of the mining area by 1 per upgrade. The Matter Manipulator can be upgraded up to 12 times, allowing liquid collection, increasing mining power, and increasing radius. It is currently the only tool which can gather liquids. Fully upgraded it is currently the best mining tool available. It will allow mining in a 5x5 area with a mining power of 4.8. However, if you only need a 2x2 tunnel straight down, a Diamond Drill is faster. An unobtainable version of the Matter Manipulator exists which has the same displayed name but performs like a fully-upgraded Matter Manipulator without needing to be upgraded first. (More information can be found at Matter Manipulator X). When using the first mouse button, the foreground fills, and when using the second mouse button, the background fills. The area of blocks filled is 2x2. By holding the shift key, an area of 1x1 will be filled instead. This can help with more detailed work. Upgrades are available when the required amount of Manipulator Modules are used in the upgrade window. The window can be opened with a button on the right sidebar. 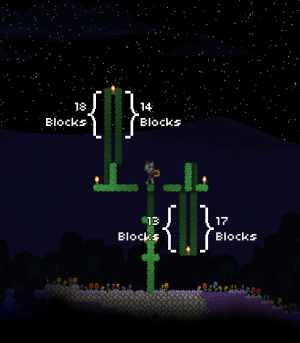 Vertically, the player can work with up to 18 blocks above the ground a player is standing from, and 14 blocks if the vertical space occupied by the player themselves is omitted. 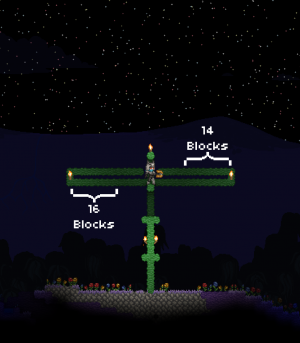 However, the player can only manipulate matter up to 17 blocks downwards, and 13 if the player is not counted. Horizontally, the player can work with up to 16 blocks to either side, 14 if the 2-block horizontal space that the player takes up is not counted. The Matter Manipulator could be using a tiny portal to a pocket dimension inside its machinery that makes it work. Your inventory is obviously not stored anywhere on your person because the Matter Manipulator projects things outward for you to place them with it, and because you can carry an entire few mountains in your inventory. Of course, the destruction of tiles may be caused by a laser, but they could also be being ripped apart from the power of a pocket dimensional portal being focused on one area. This page was last modified on 6 August 2018, at 20:38.